The Great Plains wolf at one time had the largest range of any subspecies in North America, inhabiting most of the Western United States, southeastern Alaska, and central and northeastern Canada. 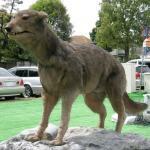 However, by the 1930s, the subspecies had been almost totally eradicated from the United States. By the mid-1960s, just a few still survived in northeastern Minnesota along the Ontario border. It is currently found in the western Great Lakes region of Minnesota, Wisconsin, Upper Michigan and Ontario. 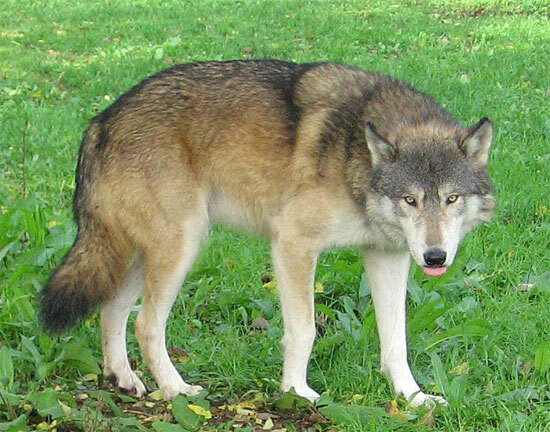 The size of the wolf's territory can vary depending on the type and availability of prey. Great Plains wolves vary from 4 1/2 to 6 1/2 feet long from nose to end of tail, and weigh between 60 and 110 pounds. The female is roughly 80 percent the size of the male. Their coat is usually a blend of grey, black, brown, buff, or red. They travel in packs of 5 or 6 wolves on average. The Great Plains wolf preys on white-tailed deer, moose, snowshoe hare, small birds, and rodents such as beaver. 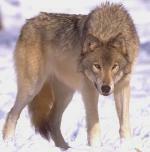 To maintain the strength of the pack, usually only the alpha male and female reproduce. Mating season usually occurs from early January through late February at such northern climates. Roughly 63 days after mating, the mother will give birth to 4 to 6 pups in a den. They become fully grown in 6 to 8 months and are sexually mature by about 22 months. It was believed the Great Plains wolf had become extinct by 1926. However, later studies showed wolves found in Minnesota, Wisconsin, and Upper Michigan to be descendants of the Canis lupus nubilus. Even then, their number became fewer and fewer until they were federally protected as an endangered species in 1974. Because of being federally protected, their population in Minnesota had become large enough to be reclassified as just threatened in 1978. By 2009, the number of wolves in the Great Lakes region had climbed to an estimated 2,922 in Minnesota, 580 in Michigan, and 626 in Wisconsin. In response, the Fish and Wildlife Service removed these 4,000 wolves from the endangered species list. As a result, the agency was sued by 5 environmental and animal protection groups and forced to return the wolves to the list - at least temporarily. The Fish and Wildlife Service still believes that the wolves in the western Great Lakes region have met the recovery criteria and don't need to be listed.